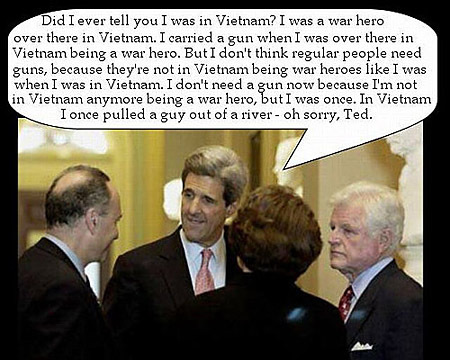 John Kerry describes a recent visit with his proctologist. Kerry voted for the assault weapons ban contained in the Violent Crime Control and Law Enforcement Act of 1993, restricting the manufacture, transfer, and possession of certain semiautomatic assault weapons and large capacity ammunition feeding devices. On November 17, 1993, the amendment passed 56-43. Kerry voted for the Brady Bill in November 1993. The legislation required a 5-day waiting period on handgun purchases, to allow local officials to conduct a background check. The bill passed the House on November 10 and on November 20, 1993, the bill passed the Senate 63-36. Kerry voted against the motion to table (defeat) the Boxer/Kohl Amendment, requiring that all handguns sold in the United States be sold with a child safety lock. On July 21, 1998, a motion was made to table the amendment. The motion to table passed 61-39. Kerry voted against the Craig Amendment that would have required that gun stores have trigger locks in stock and available for sale. The vote on the Craig amendment was immediately prior to a vote on the stronger Boxer/Kohl amendment to require all handguns sold in the United States be sold with a child safety lock. The Craig Amendment was an effort to undercut support for the stronger Boxer/Kohl amendment. On July 21, 1998, the amendment passed 72-28. Kerry voted against the Large Ammunition Magazine Ban Amendment to ban the importation of large capacity ammunition feeding devices. On July 21, 1998, a motion was made to table the amendment. The motion to table passed 54-44. Kerry voted against the motion to table (defeat) the Child Access Prevention Amendment to increase penalties for individuals who permit juvenile access to firearms. On July 21, 1998, a motion was made to table the amendment. The motion to table passed 69-31. Kerry voted for the Lautenberg Gun Show Amendment to the Violent and Repeat Juvenile Offender Accountability and Rehabilitation Act of 1999 to close the loophole allowing individuals to sell guns from their private collections at gun shows without completing background checks for purchasers. On May 20, 1999, with Vice President Al Gore casting the tie-breaking vote, the amendment passed 51-50. 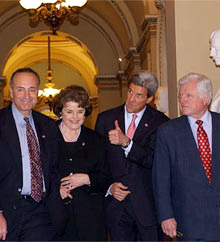 Kerry voted against the motion to table (defeat) the Ban on Unlicensed Sale of Guns on Internet, an amendment to the Violent and Repeat Juvenile Offender Accountability and Rehabilitation Act of 1999 banning the unlicensed sale of guns on the Internet by requiring websites clearly designed to sell guns to be federally licensed firearms dealers and to comply with all such federal laws. A motion was offered to table the amendment. On May 14, 1999, the motion to table passed 50-43. Kerry voted against the motion to table (defeat) Large-Capacity Clips, an amendment to the Violent and Repeat Juvenile Offender Accountability and Rehabilitation Act of 1999, to ban the importation of large-capacity magazines (ammunition feeding devices that can hold more than ten rounds). A motion was offered to table the amendment. On May 13, 1999, the motion to table failed 39-59. In 2000, Kerry signed the Democrat manifesto, “A New Agenda for the New Decade,” which, among a host of other things, calls for the development and use of “smart gun” technology to prevent use of firearms by unauthorized persons.